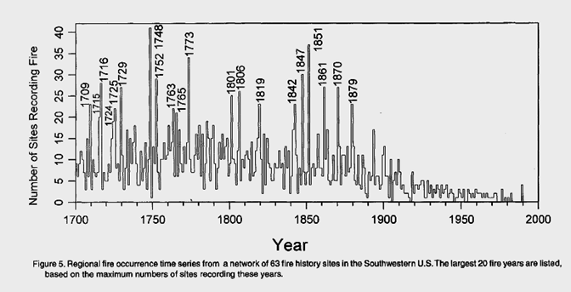 Forest Fires Were Worse During the Little Ice Age! Yelling “fire” in a crowded room is the iconic example used to distinguish free speech from license. Falsely claiming there was a fire in a crowded room would be punishable license because it could cause a panicked stampede resulting in injury. Episode 2 of Years of Living Dangerously treads dangerously close to license, as the producers present a completely one-sided biased view of forest fires purposely trying to incite climate panic. Those of us who have studied forest ecology for the past few decades have understood that bigger more destructive fires have been the result of fire suppression and a growing population. As the USA added 100 million people since 1970, more and more people moved into more forested areas and changes in fire frequency are skewed by the number of fires ignited by humans. For example the Arbor Day Foundation reports that more than 83% of forest fires in 2006 were started by human activities, accounting for the burning of nearly 4.4 million acres. In 2004, wildfires in Alaska burned more than 5 million acres, the worst year for Alaskan fires. However 426 fires were started by humans and only 275 were natural fires ignited by lightning. In 2003 California’s “Fire Siege” the first of several fires was set during military artillery practice. The biggest fire, the Cedar Fire, happened when a signal fire got out of control. While using movie stars to bludgeon us with the idea that all bad things must be due CO2 climate change, “Years of Living Dangerously” committed huge sins of omission. There is a wealth of scientific research regards the effects of fire suppression and natural cycles. Instead Arnold Schwarzenegger yuks it up with firefighters on the frontline. The episode then exploits human tragedy by highlighting the recent death of a “hot shot” crew. And Arnold (scientist?) then marries the tragedies by telling us CO2 climate change is making fires bigger, more frequent, and more dangerous. But Arnold never tells us forests that naturally experienced fires every 5 to 40 years, had built up dangerously high fuel loads. 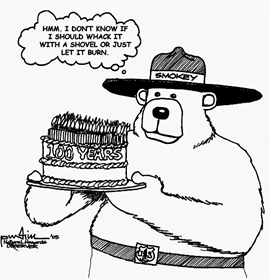 During the 20th century era of fire suppression the US Forest Service’s “10 AM rule” dominated, and every attempt was made to extinguish all small fires by 10 AM the next day. Normally those small fires would burn longer and spread further and create a mosaic of forest patches. The remaining forest patches were then buffered from any new fires that started in a neighboring patch and large catastrophic fires are very rare in mosaic habitats. A patchy forest also prevents widespread beetle infestations.1 Until the media’s recent attempts to promote climate fear, forest ecologists had always complained fire suppression was promoting larger beetle infestations. A list of research on the effects of logging, fire suppression and natural cycles on beetle infestations can be found here. Yet “Years of Living Dangerously” simply blames climate change. Nonetheless instead of providing a greater historical framework to critique natural cycles that last 60 to 200 years, they promoted untested speculation and simply reported that all the models predict more fires due to CO2 warming in the future. Other authors echoed the same findings. Estimated from early journalists’ accounts of fire throughout the Rocky Mountain region, modern fires burn less than one-fourth of the land that had burned historically. Fire ecologists debating how great an area needs to be burned to restore the natural fire regimes reported a “comprehensive assessment of burning in the contiguous United States and estimated that approximately 3 to 6 times more area must be burned to restore historical fire regimes.”1 The Westerling paper shows a peak in 1988, driven largely by the Yellowstone fires that burnt about 800,000 acres. In comparison The Great Fire of 1910 was a wildfire that burned about three million acres (approximately the size of Connecticut) in northeast Washington, northern Idaho, and western Montana. From a historical point of view, the Yellowstone fire was modest. The Peshtigo Fire of 1871 (in and around Peshtigo, Wisconsin) caused an estimated 1,500 deaths possibly as many as 2,500. It consumed about 1.5 million acres, an area approximately twice the size of Rhode Island. The combination of wind, topography and fire that created the firestorm that is now known as the Peshtigo Paradigm. Those elements that created the fire were studied and recreated by the American and British military during World War II for the fire bombings of German and Japanese cities. Nonetheless the Peshtigo fire happened the same time as the Great Chicago Fire, so it did not get a lot of media attention. However the combination of those catastrophic fires prompted a fearful public to speculate that comets, meteorites or aliens were behind those firestorms, and one must wonder if blaming CO2 for recent fires is driven by the same lack of scientific understanding. The Westerling paper argued that the greatest absolute increase in large wildfires occurred in Northern Rockies forests where fire exclusion has had little impact on natural fire regimes because those forest had only burned every 100 to 300 years and the era of fire suppression was too short to play a significant role. So they suggested that earlier springs due to climate change had caused the increase in catastrophic fires in that region. 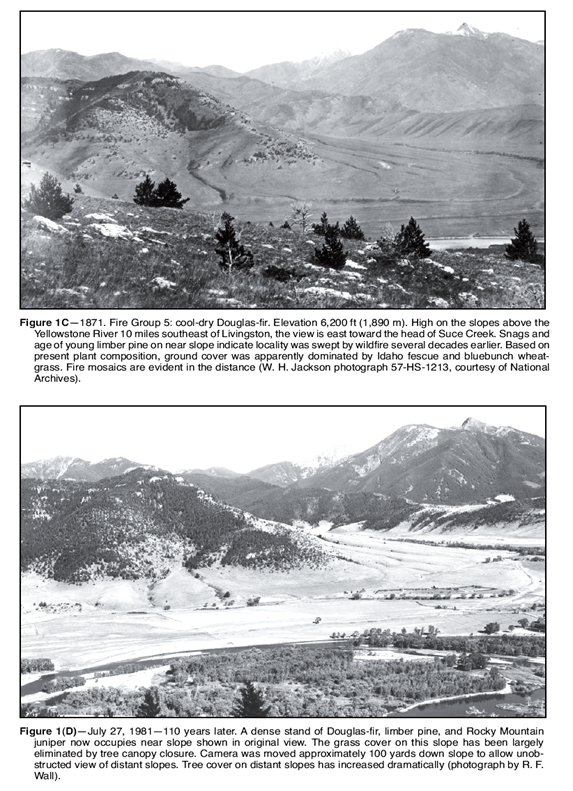 However a study by the US Forest service concluded fire suppression has played a major role in the Rocky Mountains.1 The picture below near the Yellowstone River from 1871 shows a landscape dominated by grasslands and a mosaic of forest patches (Figure 1C below). After a century of suppression, a photograph of the same area from 1981 (Figure 1D below) shows a vast expanse of interconnected forest with a high fuel load now dominating landscape and primed for a huge fire. Until that landscape recovered from the 1800s fires, large catastrophic fires would impossible. The American West also experiences decades of drought driven by natural ocean cycles. Most extreme climate events occur when a La Niña and a cold Pacific Decadal Oscillation (PDO) phase coincide, or when an EL Niño and a warm PDO phase coincide. When a La Niña and a cold PDO coincide, the southwestern United States experiences its severest droughts and heightened fire danger. For example, each phase of the PDO persists for about 20-30 years, but cycles of El Niño and La Niña alternate every two to seven years. Thus the coincidence of both a La Niña and the cool phase of the PDO has only occurred about 29% of the time. However since the 1700s that 29% coincided with 70% of all major fires in Rocky Mountain National Park. 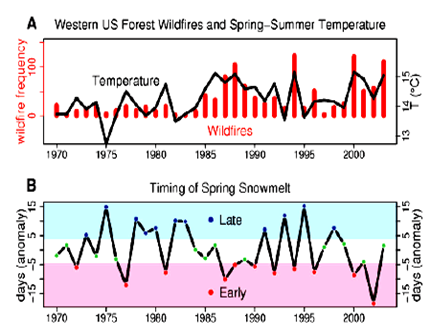 Colorado’s 2012 wildfire season was no exception.5 Snow fall and the timing of Spring’s arrival is als0 largely driven the Pacific Decadal Oscillation.6 Informing the public about those natural cycles would help them prepare better for the weather it brings, but this episode prefer fear mongering. “Years of Living Dangerously” justifies yelling fire and promoting climate fear based on Westerling paper that reports all the models show rising CO2 will cause warmer and drier weather in some places (but wetter elsewhere). However those models have failed horribly in replicating natural ocean cycles. Several researchers have shown that the warmth and drought predicted by CO2 driven models may have mistakenly modeled the climate effects of ocean cycles but blamed the results on CO2. One study from climate experts at Los Alamos National Laboratories explored the climate impacts of the PDO and Atlantic Multidecadal Oscillation on the American Southwest. “Years of Living Dangerously” takes great liberties with the truth about forest fires. Such a one-sided presentation attempting to incite climate fear borders on license. It is also the second episode in which they discuss lost rainforests that were burned for Palm Oil. Yet despite Harrison Ford’s expose on corrupt government officials, the episode has still failed to mention the European Union alone has provided $11 billion dollars in biofuel subsidies and the bulk of that has subsidized palm oil for the biodiesel industry . Is such distorted truth liberty or license? I suppose if no one is listening the question is moot. 1. Keane, et al (2002) Cascading Effects of Fire Exclusion in Rocky Mountain Ecosystems:A Literature Review. USDA Forest Service RMRS GTR-91.